If you own, or are thinking about a static storage solutionâ&#x20AC;¦stop!! 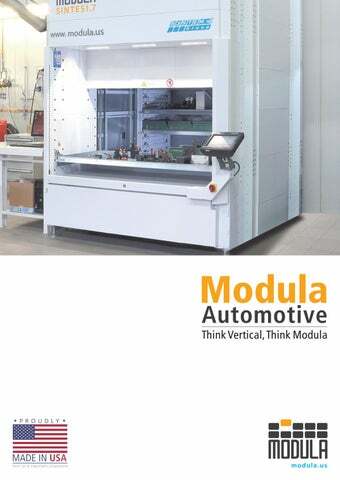 Get parts to your customers & technicians faster With Modula units parts are stored in centralized, secure units and are easy to find, no more walking while searching for parts. Parts areas, servicing both sales and service are able to benefit from the added flexibility, improved efficiency and increased throughput provided by implementing Modula units. Reduce the size of your parts area Depending on your ceiling height, a Modula vertical storage unit is able to store the same amount of parts inventory that is stored in 55-80 bays of shelving, typically equating to a 90% floor space savings for parts storage areas, recovering approx. 1,200+ square feet of floor space. Space saved allows dealers to carry a larger parts inventory, add services such as a customer lounge or increase revenues with additional service bays. Get needed parts faster, with no climbing, bending or reaching Modula VLMâ&#x20AC;&#x2122;s maximize storage utilization & productivity by bringing parts to the user. Bending, reaching, lifting heavy parts and having to walk up & down mezzanine steps or shelving aisles are all eliminated. It is possible to store common groups of parts used for service jobs on the same tray, further saving time getting needed parts to complete repairs faster. Units are equipped with user safety features to ensure a 100% safe working environment for users, guaranteed by the TĂ&#x153;V certification obtained for the entire product line. Potential of 99%+ picking accuracy & with DMS integration Modula units have the potential to interface to any Dealer Management Systems (DMS) system, allowing orders to be sent directly from the DMS system to VLM units automatically. DMS INTEGRATION BENEFITS • Approved DMS interfaces providing seamless order processing in real-time capabilities. • No code is modified or installed on your DMS, avoiding potential reliability, security, and data integrity problems. • DMS integration saves you time & increases	accuracy when using Modula WMS software. • Modula receives advance notification of changes to the DMS, supporting uninterrupted performance and less chance of disruption to your business. MODULA WMS SOFTWARE Modula WMS is a fully featured management software available to manage the space and utilization of Modula units. It can easily be interfaced with many DMS systems and nearly any ERP system. CoPilot Operator Console The CoPilot console is a rugged operator interface, that features include a 10.5” color touch screen display and an extremely intuitive and easy to use environment. Graphical views of tray layouts clearly show the user precisely where and what to pick, displaying all required information such as item number, quantity, order information, item notes, etc. U.S.A. France Italy Italy Italy U.S.A. Spain Hungary Germany China Italy Poland China Czech. Republic U.S.A. Germany Germany Romania Serbia Mexico U.S.A. U.S.A. Mexico Canada Germany China Great Britain France China Germany U.S.A. Czech. Republic Mexico U.S.A.
All information provided on this catalog is for informative purposes only and is not binding. Modula reserves the right to change information on this catalogue at any time. 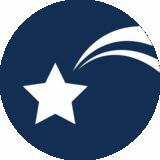 Modula will not accept liability for or guarantee the accuracy of the information contained herein.